Robert Black's interests range from traditional orchestral and chamber music to solo recitals of cutting edge music, collaborations with actors, music with computers, movement-based improvisations with dancers, and live action-painting performances with artists. He has commissioned, collaborated, or performed with musicians from John Cage to D.J. Spooky, Elliott Carter to Meredith Monk, Cecil Taylor to Paquito d’Rivera, as well as many young emerging composers. His recital activities frequently take him to five continents and he has appeared at major festivals (Takefu International Music Festival, Japan; Festival de Eleazar Carvalho, Fortalzea, Brazil; Colombo-Catalan Festival, Medellin, Colombia; the Helsinki Festival; New Music on the Point (Vermont), etc., on radio and television broadcasts (Asia Live, Singapore, VPRO, Holland; NPR, United States; CBC, Canada; etc.) and as an artist-in-residence (Omnibus Ensemble, Tashkent, Uzbekistan; American Center, Paris; the Banff Centre, Canada. Robert is a current and founding member of the Bang On A Can All Stars, New York City’s hard-hitting new music ensemble. He recently joined the chamber group, Cuatro Puntos. Additional chamber music activities include annual appearances at the Moab Music Festival and the Festival de Eleazar Carvalho in Fortaleza, Brazil. Collaborative performances include dancer/choreographer Katie Stevinson-Nollet (“Je Ne Sais Quoi”), Kathryn Walker and the Music Theater Group (The Odyssey), the Full Force Dance Company (Life, Death, Immortality), films by Rudy Burckhardt, and live action-painting improvisations with the Brazilian painter Ige D'Aquino. Current commissions include a doublebass quartet by John Luther Adams and an evening length work by Swiss composer, Marcel Zaes for double bass and electronics (or double bass trio). Recently completed were a Philip Glass commission for a 7-movement solo Partita that includes recited poetry by 7 of downtown New York’s most illustrious musician/poets, and Possessed, a series of solo improvisatory outdoor performances in Utah’s rugged canyon/desert landscape released as a DVD and on Cantaloupe Music. 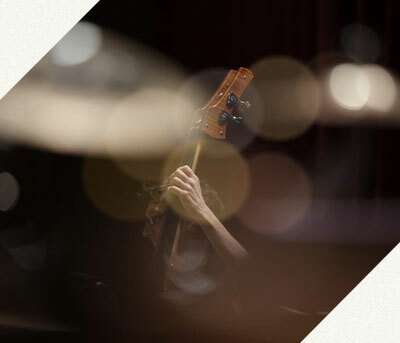 His solo recordings include Possessed (Cantaloupe Records), the double CD Modern American Bass featuring mid-20th Century American bass repertoire (New World Records), The Complete Bass Music of Giacinto Scelsi (Mode Records), The Complete Bass Music of Christian Wolff (Mode Records), and State of the Bass (O.O. Discs). He has recorded 25 CDs with the Bang On A Can All Stars (Cantaloupe Music) and has also recorded for Sony Classical, Point/Polygram, Koch International, CRI, Opus One, Artifact Recordings, Folkways Records, and others. Robert maintains a full teaching schedule at The Hartt School at the University of Hartford, the Festival Eleazar de Carvalho (Brazil), and is on the faculty of the Manhattan School of Music’s Contemporary Performance Program. He was recently on the Faculty of the New Music on the Point Festival. For 10 years, Robert was on the Board of Directors for the International Society of Bassists (ISB), and for 7 years, he served as the editor of the New Score column in the Journal Bass World. He is currently the Director of the Ned and Frances Black Fund, judge emeritus of the ISB’s biennial International Composition Competition and a frequent adjudicator for the Concert Artists Guild Competition in New York City.